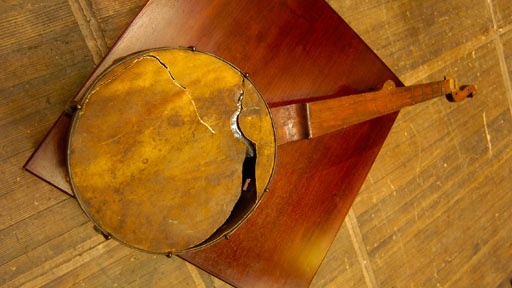 A beautiful, worn banjo is purchased by a Chicago resident at an auction a few years ago. A tattered note inside says the banjo dates to the mid-1800s and was bought from a former slave in Bethel, Ohio, by an abolitionist family some time after Emancipation. According to the note, the slave who owned the banjo and the boy who ultimately purchased the banjo had once shared a classroom. Could this be the only slave banjo known to exist? History Detectives is off to Ohio and Maryland to trace the roots of two American families divided by racial lines during the Civil War and to track the surprising lineage of an instrument that has contributed to more than 200 years of American music. Related Investigation Preston Brook's Riding Crop Was this riding crop a gift from Jefferson Davis as a reward for attacking a political opponent? Also with Wes Cowan Lewis & Clark's Cane Was this family heirloom a gift from the famous explorers Lewis and Clark? Also in Season 3 WWI Chemical Warfare Map Could this map be an authentic relic from a critical WWI battle? Also in Season 3 Szyk Picture Could these be early drawings of America's most influential political cartoonist? Also with Tukufu Zuberi Satelloon Could this three-inch square of metallic material be part of America's first satellite program?